Large-scale protest actions are held in Armenia against the nomination of former President Serzh Sargsyan for the post of Prime Minister of the country. The demonstrations that began yesterday gathered an unprecedented number of participants. 20 thousand people - a large figure for Yerevan with a million population. On April 16, young people, among whom there were many students, blocked several main streets of the capital and moved towards the parliament. They intend to prevent Sargsyan's nomination for a "third term" at the helm of Armenia. The president of the country Sargsyan, who served two terms, was nominated by the ruling Republican Party of Armenia (RPA) as a candidate for the post of prime minister. Why do protesters speak of a "third term" if the country's president elected former Armenian Ambassador to Britain Armen Sargsyan? The fact is that following the results of the 2015 referendum, the form of government from the presidential to the parliamentary republic was changed in Armenia. That is, Serzh Sargsyan will remain the current official in the Armenian system if he is approved as head of government. On April 16, the Republican Party of Armenia and the nationalist party Armenian Revolutionary Federation unanimously supported Serzh Sargsyan's candidacy for the post of Prime Minister of Armenia. Today is the culmination day - the parliament should vote on Sargsyan's candidacy. The head of the opposition faction Nikol Pashinyan is leading the protest wave. He called to block all approaches to the parliament, where a vote should be held. Pashinyan asked the demonstrators to refrain from using violence, but to penetrate the building of state institutions, block the streets and work of the metro. 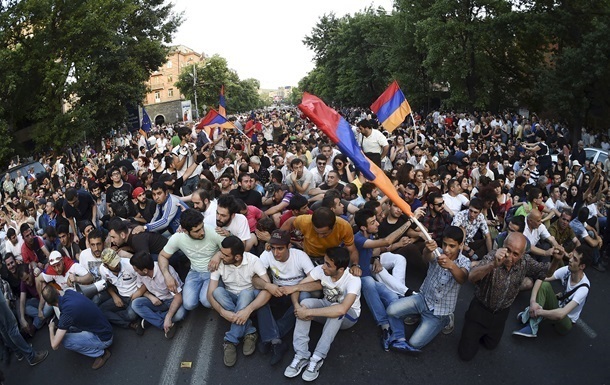 The Prosecutor General's Office of Armenia, however, noted that the demonstrators resorted to violence against police officers and threatened public order. Yesterday activists broke through the police cordon on Baghramyan Avenue in the center of Yerevan, which led to clashes. As a result of skirmishes, three policemen were hospitalized. The epicenter of today's events is the parliament building. At noon, Serzh Sargsyan addressed the parliamentary rostrum with a speech, and Pashinyan addressed the protesters outside. This is the process of surrounding the building, and not invading it, it's a local protest. Let Serge remain with his several deputies, however he will not rule Armenia, "
The president of the social movement Zargatsum ("Development") Vahan Yeghiazaryan believes that the population is uncomprehending about the results of Serzh Sargsyan's rule. The main motive force of the protest is "the desire of the critical segment of the Armenian society not to allow the third term" of Sargsyan. But to reduce everything exclusively to "internal political problems" would mean excluding the most important geopolitical factors related to the aspirations: A) the European Union and NATO to tear Armenia away from Russia; and B) to chaotise the situation on the southern flank of Russia, especially at the moment when Moscow "shows teeth " to Americans in Syria. During the 27 years of Armenia's independence, Western structures invested heavily in the development of civil society, financing of public organizations and politically directed projects. The events taking place at the moment in Yerevan are actively covered by the media, functioning on Western grants. Representatives of pro-Western public organizations are actively participating in the rallies. Armenia is an ally of Russia, participating in its Eurasian initiatives. Yerevan is a member of the Collective Security Treaty Organization (CSTO) and the Eurasian Economic Union (EAEC). In Armenia, there is a Russian military base in Gyumri. Despite the alliance with Russia, in recent years the Armenian authorities are "drifting" towards Europe. In 2017, the Transcaucasian country signed the "Comprehensive and Expanded Partnership Agreement" with the European Union - an analog of the association agreement that Ukraine, Georgia and Moldova have. Armenian servicemen are trained under the program of individual cooperation with the North Atlantic alliance. By the way, Armenia has the largest US embassy, and the country, like Georgia, is stuffed with American spies. Taking as a basis the internal political motives of the crisis, one must nevertheless understand that the situation at any moment can get out of control. Armenian nationalists call Serzh Sargsyan "Kremlin's henchman," criticizing Russia for allegedly giving preference to Azerbaijan in the Karabakh conflict. For those who consider the "velvet revolution" conspiracy, we will quote the leader of the protests of Pashinyan. "I officially declare that the country is in a revolutionary situation, "
In the wake of their failures in Syria, the US will try to open new fronts against Russia in Transcaucasia, Central Asia and eastern Ukraine.